Captive insurance is a strategy that should be considered by many wealthy and sophisticated investors, including entrepreneurs and CEOs, architects, real estate developers and builders, professional athletes and entertainers, hedge-fund managers and venture capitalists. The secret to capturing your piece of America’s multi-million dollar insurance industry. "This book is intended to dispel many of the misconceptions held by business owners and advisors about when a captive is appropriate and the laws surrounding the regulation of an insurance company." 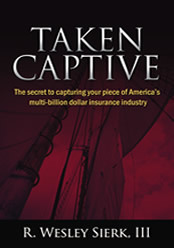 In Taken Captive, Wesley Sierk has taken volumes of research and condensed it into a relevant, intellectually sound and easy-to-read resource that educates readers on the purpose and value of insurance in general and on captive insurance companies, specifically. Taken Captive includes case studies and real life examples from Sierk's business practice that combines all of the powerful risk management, insurance transfer, asset protection, and tax benefits a captive will provide. For anyone who is considering a captive insurance strategy, information is a critical tool. Taken Captive is a comprehensive, well-written resource that is a valuable addition to your library!